HALLE BERRY as Luisa Rey in the epic drama “CLOUD ATLAS.” ©Warner Bros. Entertainment. 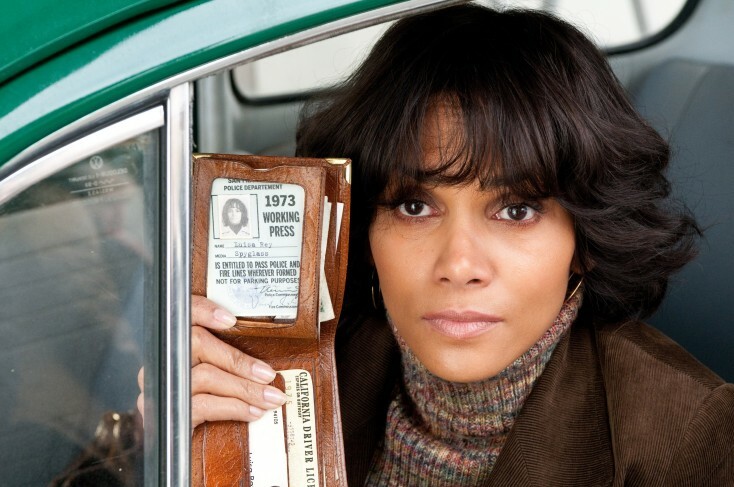 HOLLYWOOD—Halle Berry arrives for an interview with her breakfast in tow. The Oscar winning actress (“Monster’s Ball”) is on a tight schedule today and can’t waste a moment to stop to eat. She is promoting her new movie, the strange and surreal Warner Bros sci-fi epic “Cloud Atlas,” based on the David Mitchell best-seller, and made by the sibling directing team that brought us “The Matrix” trilogy, in conjunction with the director of “Run Lola Run.” In this near three-hour metaphysical drama about reincarnation and redemption, Berry plays not one but six characters, including an Asian doctor, a mid-20th century Jewish trophy wife and a futuristic hero. Dressed in a wine-colored v-neck sleeveless top, shiny skintight black pants and black boots, the beautiful Berry appears nowhere near her 46 years. With her shortly cropped hair and multiple ear piercings, she has an almost retro-punk look about her. The actress, a divorcee and mother of four-year-old daughter, Nahla, who is engaged to hunky French actor Olivier Martinez, explains she almost had to drop out of the film just as she was just getting started. Two days into shooting on the Spanish island of Majorca, she slipped and fell, breaking five bones in her foot. Ever the trouper, Berry had her foot wrapped and the accommodating filmmakers Andy and Lana Wachowski and Tom Tykwer, reworked the schedule around their injured leading lady. She had her very own human transporter to carry her from her trailer to the set, until she had recovered sufficiently to walk on her own. Q: This movie pushes boundaries in every imaginable way. Has it changed your view on reincarnation? Berry: It just affirmed things that I’ve always believed. I think I started off very young in my life questioning. For a while, I was studying Buddhism. I’ve always thought what was I before I was this and then what will I be when I leave here. I’ve really had a hard time accepting that at some point I’m just going to turn to dust and ashes and never be again and that the journey would stop. So I just believe that we are souls, kind of like a version of what our movie presents, and we come here again and again until we arrive at our highest evolution. What happens after that, I don’t know. But I just don’t think it’s some abyss of nothingness and that we fall off and that our journey stops. I think it’s circular and we go and we go and we go. Q: Which of the six characters did you find the most fun to do? Berry: I loved them all. I mean that’s what I have to really say. I have to say I did love being turned into Dr. Ovid. I mean to be an Asian man, like never before in my life would I ever had thought anybody would anywhere hire me to be an Asian man for any reason. So that was probably a day that I felt like I’m doing something that’s unique and I’ll never have a chance to do again. But I loved the totality of all the characters. To be an old native (Maori) in the 1800s and then go on to be this extraterrestrial kind of being from another planet that came down to help this other group of people was great. I felt like it was such a diverse group of people that I got asked to play that it’s hard for me to choose which one (I like best). They all had reasons why I loved putting on those skins and being those characters, and trying to bring them to life for me. Q: How did you interpret your characters? Berry: Playing a (well to do) Jewish white woman was particularly significant for me because I was in the costume fitting with Tom Tykwer trying to bring (that 1930s character) Jocasta to life, and he was bringing out one beautiful dress after the next, and I’m trying them all on. He says, “Oh, you look so beautiful. You must have worn (period) dresses like this before.” And I just kind of looked at him and said, “You think so? You think I have? Really? As an actor you think I’ve done this before?” He’s like, “Yes. I mean you look good in everything. You’ve had to have done this before.” And I said, “Tom, think about it for a minute.” And then all of a sudden he goes, “Oh you’re black. You wouldn’t have been this kind of woman in 1935. Right?” So there were little moments like that that were so poignant to me as an actor. Q: How do you feel about your celebrity? Has the media made you what you are in a way? Berry: Well, here’s the thing: I’ve never wanted to get away from it. I want my daughter away from it because she hasn’t made a choice to be in this business. She needs to grow up as a little girl and should be afforded all the normalcy of every other kid. It’s my job as her mother to provide that for her at whatever cost. That’s what I’m going to do. What’s not fair is what happens to children (of celebrities). They shouldn’t be subject to (paparazzi). Me, I’m not complaining about. I can deal. I’m a grown up. She’s four. She doesn’t even understand. She has no mechanisms to deal with this. I don’t want my daughter to be the guinea pig and when she’s 18 become a hot damn mess because I didn’t take her out of it when I have the wherewithal to do that. That’s too high of a price for me to even consider paying for her. Q: You’re won an Academy Award and starred in some very successful films, and have a huge fan base around the world, but what validates the work for you? Berry: I just love that I get to wake up every day and earn a living. I mean I’m raising my family. I’m living my life and doing something I love. I’m not one of those people who are always saying, ‘Thank God it’s Friday.” I never even care that it’s Friday or Sunday or Monday. The structure of my life is just such a different climate. It’s a different environment, and it does just feel like fun. I often feel so lucky that I keep getting asked to do it, and I keep getting paid to do it, and I get to try new things and stretch myself. Sometimes things work and sometimes they don’t, but that’s the nature of being an actor is all about. Q: Can you talk about the injury you got in Majorca? How far into the filming process were you, and what went through your head? Q: Did it affect the production schedule? Berry: People had to change their schedules around. They were supposed to be done and they weren’t going to be done. So it was a big shift, and everybody just sort of rallied around. Q: How were you able to go back to work? Berry: I found out with lots of tape and wrapping and things, that could be done and I could get me through the process. I found ways to just grin and bear it. Q: How was it working with three directors? Berry: They had one vision. I personally thought after I said “yes” to the movie, that it was going to be a nightmare. Three directors? I’m going to feel schizophrenic, and who am I going to listen to? And is this going to work for how I like to work? But it was just seamless. They were all on the same page going from one unit to the next. Berry: There are things I’m looking at. I have a couple of films coming out this year that I worked on last year. What else I’m going to do new, I don’t know. I have a four year old. So it’s a juggling act.